Those are descending wedges. Under normal circumstances, those wedges would be expected to be terminating patterns and that prices would break up. However, if we are in wave 3, and the last two day’s action sure looks like it, then prices may just slide right out the end of those wedges and spill downwards like water obeying the call of gravity. This is what happened to these patterns in ’08 – so I think this is an important point as they are forming just above key support in the 1,040 SPX area. Break the currency triangles and throw the dollar higher, then we spill out the bottom of these. Currencies hold and we bounce. Bonds are also moving sideways. Oil is up a little this morning, while gold set another all-time new high at $1,253.90, which follows yesterday’s new all-time closing high. Yesterday’s close took the Transports, the NDX, and the RUT to a close beneath their respective 200 day moving averages. 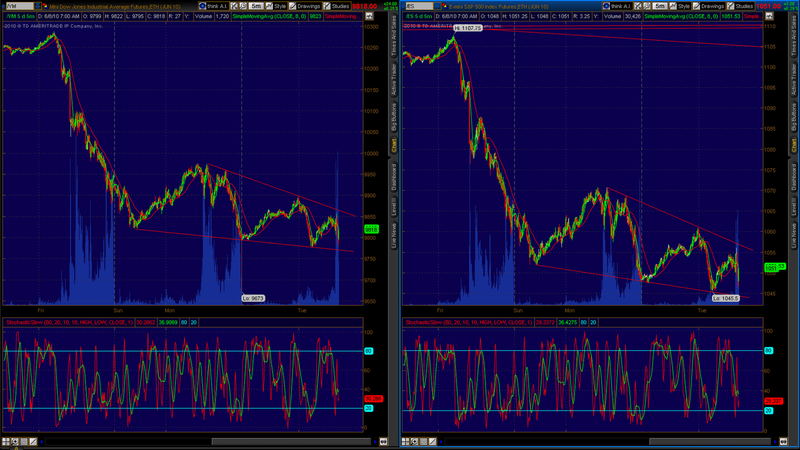 Both the Transports and the Industrials made new lows together, this is confirmation of the bearish trend. Both the Industrials and the SPX closed below the closing lows of last February. This places the S&P 500 in the same place we were NINE months ago, last September! If that weren’t bad enough, it also places prices where they were in January – get this – 1998! That was more than 12 years ago, and I want to be clear, stocks overall did NOT perform that well! No, always keep in mind that these are indices and they suffer from substitution bias – buying and holding individual stocks will net you poorer performance overall. Notice on that chart above that we are sitting right on the 200 MONTH moving average. 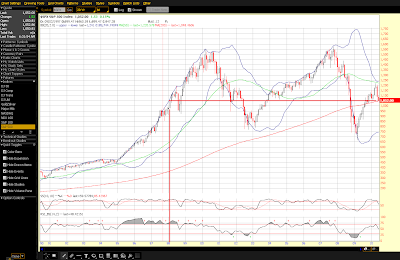 Note, too, that the RSI and monthly Stochastic are on monthly sell signals just coming down out of overbought. But don’t worry if you happen to believe that stocks always go up and thus you buy and hold “for the long run.” No, Bernanke, who has done such a wonderful job of forecasting the future notes that recovery “won’t feel terrific.” Gee, that’s nice. I guess he means unless you are a central banker. He warned the unemployment rate will remain high "for a while," explaining, "that means that a lot of people are going to be under financial stress." So, with all that stress, where are the bailout trillions for the people? I mean when the financial system was “under stress” we threw trillions at it, but when the people are under stress what action do we take??? Oh, Ben has a plan - “the Fed will raise interest rates from a record low before the economy returns to “full employment,” Bernanke said. That’s nice. According to reports, Bernanke talked about the need for U.S. leaders to take control of the nation's deficits over the medium term, some three to six years from now, in a way "that will allow us to bring our fiscal house in order over a long period of time." But when asked if the nation has such a plan, or if he's seen one, Bernanke said: "No. Not yet. I don't." Hmmm… Guess he doesn’t want to talk about Freedom’s Vision because that would mean he’s out of a job! It would also end the central banker debt-backed money box paradigm which is key to finding any true solution. There are no worthy economic reports today, yesterday’s Consumer Credit report stunk up the joint again. First, the March number that was reported as +$2 billion was revised downward to show a $5.4 billion contraction, gee, nearly 300% off in the totally opposite direction of what was originally reported. Nice. Consumer credit rose $1.0 billion in April in a gain far offset by a $7.4 billion downward revision to March which now shows a $5.4 billion contraction. Non-revolving credit, reflecting strong car sales, jumped $9.4 billion in April but was offset by a nearly as large of a fall in revolving credit. The drop in revolving credit reflects the month's slowing in ex-auto retail sales. Vehicle unit sales firmed further in May pointing to a gain for the non-revolving side. But early retail indications for May are flat, pointing to offsetting weakness on the revolving side. Consumer spending has been an important factor for first-half strength, reflected to a degree in this report where a record contraction came to an end in January. But improvement in this series has been choppy and will no doubt turn on progress in the labor market, which for May was very soft. This is a very weak Consumer Credit report, it shows that people are not out spending wildly with their credit cards. John has been in the hyperinflation camp for quite some time, calling it “imminent” on several occasions. Yet, that’s just not what we’re seeing, we are seeing contracting money supply, contracting credit, and we’re seeing contraction in the shadow banking world of derivatives. Will this bring about hyperinflation? I do believe that their reaction to a deflationary spiral could lead to it yes, but that would mean massive printing without debt backing that printing for it to happen – OR, it can also come about because we have so much debt that people just lose confidence in our ability to ever repay. Either outcome is the same in the end, no one wants to hold your money. Right now, though, because everyone is trying to get out of DEBT, they NEED our money. 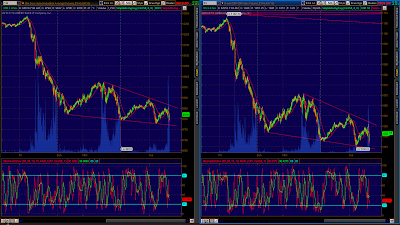 Again, watch the 88.8 level on the dollar. Bernanke, buddy, there’s something less than genuine about you… and listening to you talk, frankly, pisses me off.